Basically the BBC maintained it could get enough live broadcast music out of freelance players, independent orchestras and a reduced number of house orchestras - six as opposed to eleven. The 1980 strike received support from many leading musicians including Colin Davis, Pierre Boulez and Carlo Maria Giulini and was finally resolved by a compromise agreement. This resulted in the dismantling of the Scottish Radio Orchestra with an associated loss of jobs but the BBC Scottish Symphony Orchestra was saved, albeit with damage to its personnel complement that took some years to correct. There is a planned 48-hour strike by BBC staff on Oct 5-6 2010 over proposed changes to the corporation's pension schemes. Yesterday high profile BBC news presenters including Jeremy Paxman and political editor Nick Robinson spoke out against the proposed strike claiming it threatens the BBC's impartiality. Celebrity presenters can supplement their pension entitlements with continuing broadcast work plus lucrative book and after-dinner speaking deals. Rank and file musicians and composers are not so fortunate. Jeremy Paxman and his highly paid colleagues should reflect on the fact that the BBC Scottish Symphony Orchestra, one of the glories of musical life in Britain today and an impressive champion of contemporary music including jointly commissioning and then recording Jonathan Harvey's Speakings, would not be with us today without the brave strike action of BBC Musician Union members in 1980. * Is the Red Light On - the story of the BBC Scottish Symphony Orchestra by John Purser. (Published by BBC Scotland, ISBN 0563205202). Out of print and difficult to find, but Chapter 8 Strike is essential reading for anyone involved in classical music. ** Wonderful article on the Scottish Radio Orchestra (formerly the BBC Scottish Variety Orchestra) including programmes and a sound clip here. Also worth noting that Simon Rattle's career took off after he was appointed Associate Conductor of the BBC Scottish Symphony Orchestra at the age of 19, while Andrew Davis' first major post was as associate conductor of the orchestra in 1970. Eddie McGuire is mentioned in an article I linked to in my recent John Cage post. 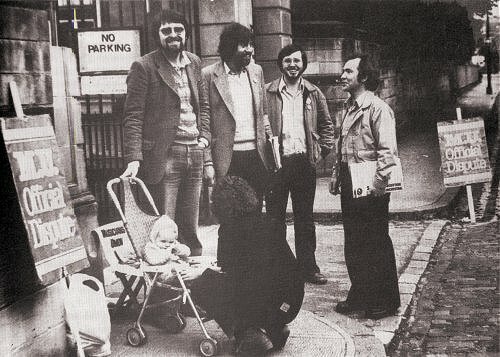 Cage's Scottish Circus was commissioned by Eddie's band The Whistlebinkies. Such unstable orchestral times these. Along the same lines the Detroit Symphony Orchestra (which is one of the world's great orchestras despite its lacking some of the marquee cachet attached to some other American orchestras) is going on strike as of 10/5. Let's hope the involved parties find a way to bring things back together.